Browse below for dog friendly self catering cottages in Tetbury. Stylishly set this lovely holiday home occupies the west wing of a county manor house with complete privacy, country views to die for and located near to the market town of Tetbury, it's a country chic getaway. 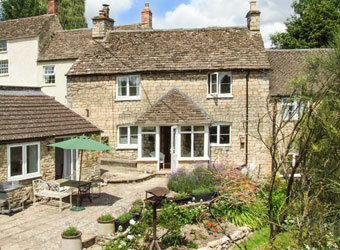 Delightful, stone-built, semi-detached cottage on the outskirts of Tetbury. This cottage sleeps 4, in 3 cosy double bedrooms, including an external private studio complete with ensuite facilities.